Visit both Hakone and Kamakura in one day on this day trip from Tokyo. Start the day off admiring the stunning natural scenery on offer in Hakone and end it by exploring the fascinating former ancient capital city of Kamakura. 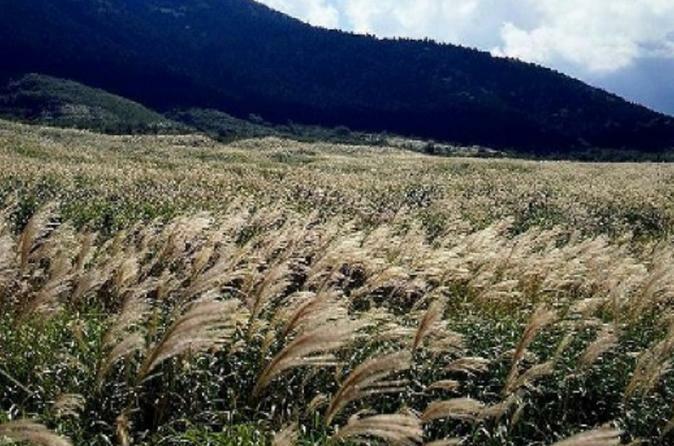 The tour begins with a trip to the Sengokuhara Japanese pampas grass fields before heading to Owakudani where you will get to ride the ropeway to Togendai. From there, board the sightseeing ship and enjoy a cruise around Lake Ashi with wonderful views of Mt. Fuji on a clear day. Afterwards, head for spot of shopping in Odawara and then on to Kamakura where you will have an ample two hours to explore before heading back to Tokyo. Please note: This seasonal tour runs annually between September to early of November. The dates are subject to change. Meet at Shinjuku nice and early at 6:50 ready for a packed day visiting Hakone and Kamakura, two very popular towns for tourists within easy access from Tokyo. The tour kicks off at Sengokuhara Pampas Grass Fields ( susuki in Japanese) which, in autumn, turns a part of Mt. Hakone into a silvery gold carpet drawing many visitors. Wander through the tall, long grass using the trails for half an hour and enjoy the hillside landscape. Next up is Owakudani, an area of high seismic activity which is immediately obvious from the spewing volcanic gases. You have half an hour to walk around the area where you can get close to the crater (within the designated areas), try the famous black eggs boiled in the surrounding hot spring water and appreciate the wonderful views of Lake Ashi and Mt. Fuji. Then, board the ropeway for a 16 minute journey where stunning aerial views combining Lake Ashi, Mt Fuji and the rising fumes of Owakudani can be had. Get off the ropeway at Togendai, which is the crossing point from the ropeway to the sightseeing cruise. Stroll to Kojiri Port and board the pleasure boat for a cruise around Lake Ashi. Enjoy the gorgeous contrast between the crystal clear blue water and the magnificence of Mt.Fuji surrounded by trees. Arrive at Hakone-en Port after 15 minutes and pop back onto the bus again and head to Odawara. Once at the city, enjoy a spot of retail therapy for half and hour before the journey to Kamakura, the last stop on the itinerary. Kamakura is an ancient city sprinkled with many must-see temples and shrines surrounded by mountains and Sagami Bay, making it a popular destination with tourists. Enjoy a generous two hours exploring the coastal town with some of the standout attractions including the Daibutsu ('Giant Buddha'), Tsurugaoka Hachimangu Shrine, Hasedera Temple and Komachi-dori street, a pretty avenue of around 250 shops and cafes. The tour then returns to Shinjuku with a scheduled arrival of 18:00.